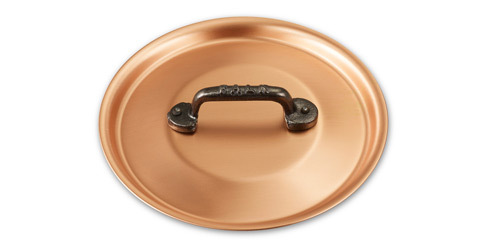 We know you'll love this	16cm copper lid	as much as we do. 1331 customers found this review helpful. Did you? Yes, I did! Very pleasant looking and practical The 16cm copper lid looks fantastic and make the accompanying saucepan/spherical pan look the part. Not thick and heavy, but nice and light, so perfectly practical. Your cast iron handle fits snug in the hand. 1253 customers found this review helpful. Did you? Yes, I did! Nice lid! Perfect for a 16cm pan! Beautiful brushed finish as same as cookware! It is a quality and durable lid! 1213 customers found this review helpful. Did you? Yes, I did! Completes my saucepan My little saucepan requires a perfect lid and this does it. That said, have later upgraded original review from 3 to 4 stars, as it is well designed and fits very nicely with the overlapping lip. 1183 customers found this review helpful. Did you? Yes, I did! 1136 customers found this review helpful. Did you? Yes, I did! Great product Purchased to go with the 16cm saucepan. Fits perfectly and can't be accidentally knocked off the pan while cooking. 982 customers found this review helpful. Did you? Yes, I did! A Well-made Lid for Saucepan This lid is well-made, fits the associated saucepan perfectly, is robust, but, like the saucepan, gets too hot to handle without oven gloves or similar. 972 customers found this review helpful. Did you? Yes, I did! Icing on the cake Not really necessary but a lovely little luxury to go with your pans. Great seal means that you can get (and keep) things at the right temperature with very little wastage of energy. 965 customers found this review helpful. Did you? Yes, I did!